Fall Out Boy is a band formed in 2001 in Glenview, Illinois after good friends Joe Trohman and Pete Wentz met high schooler Patrick Stump. Stump originally auditioned as a drummer, but soon became the lead singer. The following year, the band debuted with a self-released demo and followed it up with the May 28, 2002 release of Split EP, which featured Project Rocket, on Uprising Records. The group released a mini-LP, Evening Out With Your Girlfriend, also on Uprising Records, in 2003. 2003–2004: Independent success After the release of their mini-album, Fall Out Boy built a large cult following playing in the Chicago area and drummer Andy Hurley, formerly of Racetraitor, joined the band while the two other members left. At this time, Stump also took over rhythm guitar duties. After signing to Fueled By Ramen, they released their first full-length album, Take This to Your Grave, on May 6, 2003. With singles Grand Theft Autumn/Where Is Your Boy and Saturday receiving video airplay on FUSE and mtvU and radio airplay on alternative stations across the country, the band soon gained a cult following. The album sold very well and eventually achieved gold status, but only after the success of their next album, From Under The Cork Tree. In mid-2003 the band signed with Island Records, part of the super label The Island Def Jam Music Group along with Def Jam Records. While recording their mainstream debut, they released the acoustic EP My Heart Will Always Be the B-Side to My Tongue on Fueled by Ramen, May 18, 2004. It debuted at #153 on the Billboard Top 200, their first entry on the chart. The two-disc set included a DVD with videos, more acoustic performances and a fan photo gallery. 2005–2006: Commercial debut On May 3, 2005, Fall Out Boy released their major label debut, From Under the Cork Tree, which debuted on the Billboard 200 at #9, selling over 68,000 copies in its first week. The album achieved double platinum status and has sold over 2.5 million albums in the US alone. Earlier that year, the band’s stability was threatened when Wentz overdosed on the sedative Ativan in a failed suicide attempt. The track 7 Minutes In Heaven (Atavan Halen) from their album From Under the Cork Tree is based upon Wentz’s attempted suicide. Their first single, Sugar We’re Goin’ Down, peaked at #8 on the Billboard Hot 100, #6 on the Pop 100 and #3 on the Modern Rock Charts. The video reached #1 on MTV’s TRL, where it was retired on August 26, 2005. The video also won the MTV2 Award at the 2005 MTV Video Music Awards, prompting a huge new interest and surge in sales. The band was also nominated for “Best New Artist” at the 2006 Grammy Awards. The second single off the album, Dance, Dance, became their second Top 10 Single when it peaked at #9 on the Hot 100. It also reached #6 on the Pop 100 and became the bands top charted hit when it reached #2 on the Modern Rock Charts. The video for the song premiered on TRL on October 11, 2005; it soon reached #1 and was later retired on January 17, 2006. The third single off the album, A Little Less Sixteen Candles, A Little More ‘Touch Me’, was much less popular than both prior singles but still managed to peak at #65 on the Hot 100 and hit #1 twice on TRL, retiring on June 6, 2006. 2007: Continuing prosperity Fall Out Boy’s fourth album, titled Infinity On High, was released on February 6, 2007. The lead single, This Ain’t A Scene, It’s An Arms Race, debuted at the 2006 American Music Awards. The video debuted on MTV on Tuesday, December 19, 2006. In the album’s opening week, Infinity on High reached number 1 on the Billboard 200, selling 260,000 copies. “This Ain’t a Scene, It’s an Arms Race” peaked at number 2 on the UK Singles Chart on February 4, 2007, making it their most successful song in the UK to date. The single also peaked on the U.S. Hot 100 at number 2 and the U.S. Pop 100 at number 1. The Carpal Tunnel Of Love (the second single released from the album) reached number 81 on the U.S. Hot 100 by way of digital sales alone. Thnks fr th Mmrs was released on April 9, 2007 and made it to #14 on the Billboard Hot 100 and peaked at #12 on the UK Singles chart. 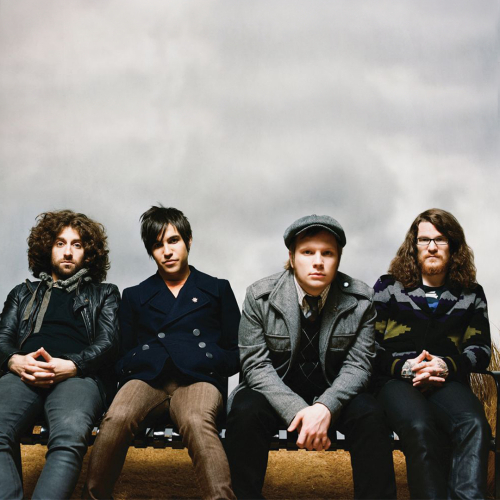 Showing their versatility, Fall Out Boy has collaborated with rappers Kanye West, Babyface, Jay-Z, and Timbaland. Babyface produced and Jay Z is featured on Thriller. They also worked with Timbaland on his new album Timbaland Presents Shock Value, where they are featured on the track One and Only, for which Stump and Wentz both contributed in writing. Stump was also featured on two songs with Gym Class Heroes (also signed with Fueled By Ramen), including their #1 Single Cupid’s Chokehold. He also was a guest vocalist on Motion City Soundtrack’s single, Everything Is Alright as well as contributing to If You Could Remember. 2008-2009: On April 1, 2008, Fall Out Boy released their live album, **** Live in Phoenix. The album was recorded in Pheonix on June 22. It contained a studio recording of Micheal Jackson’s Beat It with John Mayer as a guest on the guitar. On December 16th, 2008, Fall Out Boy released their 5th studio album, Folie à Deux (literally meaning “madness shared by two”). The lead single for the album, I Don’t Care was released September 8, 2008. On November 17, 2009, Believers Never Die - Greatest Hits was released, featuring two new songs titled Alpha Dog and From Now On We Are Enemies. Along with the news of the release of the CD we also got some not so great news, Fall Out Boy are currently on a break. "We're just taking a break and decompressing. We're not putting terms on when we're coming back. We're going to come back when everybody's excited about it and it's fun." says Pete Wentz to J14 Magazine. 2010-2012: Hiatus In early 2010 the band entered a state of hiatus, with each member eventually going off to explore their own musical interests. Wentz formed DJ duo Black Cards with singer Bebe Rexha in July 2010, releasing an EP before Rexha quietly left the group in January 2012. Trohman and Hurley started the band The Damned Things with Scott Ian from Anthrax and members of Every Time I Die, releasing their debut album Ironiclast in December 2010. Stump recorded his debut solo album Soul Punk which was released on July 26, 2011. Despite gaining generally positive reviews, ticket sales were poor with many Fall Out Boy fans unwilling to follow him in his new musical direction. This negative feedback caused Stump to create his blog entry "We Liked You Better Fat" in which he honestly aired his feelings, causing Wentz to reach out to him and ultimately begin collborating again musically in February 2012. 2013-2014: Reunion and Save Rock and Roll During 2012, the band reformed and began attempts to reinvent their sound. Sessions were difficult, with early attempts a struggle to produce new material. On February 4, 2013 the band simultaneously announced their reunion, a new single My Songs Know What You Did in the Dark (Light Em Up) and the album Save Rock and Roll which was released the following month. 2014–2016: American Beauty/American Psycho Centuries - the first single of Fall Out Boy's sixth studio album - premiered on September 8, 2014. Another song titled Immortals was released October 14, 2014, as part of the soundtrack for the Walt Disney film Big Hero 6. On November 24, 2014, the title of Fall Out Boy's sixth studio album was announced as American Beauty/American Psycho; the album was released on January 20, 2015. 2017–present: MANIA On April 27, 2017, Fall Out Boy announced that their new album was set to be released on September 15, titled M A N I A. The first single, Young and Menace was released the same day. The second single, Champion" was released in the U.S. on June 22 and worldwide on June 23. On August 3, 2017, Patrick Stump tweeted that the album's release would be pushed back to January 19, 2018, because the band were not satisfied with the results of their work at the time.